The O.J. Simpson trial introduced America to so many new faces and names that it's often difficult to keep track of all of them — like Game of Thrones-level difficult. LAPD Detectives Philip Vannatter and Tom Lange were the lead investigators on the case, making them very important figures among the many people involved. ESPN's OJ: Made In America docuseries reintroduces the pair of detectives and shows their involvement in both the investigation and the trial itself, in which Simpson was found not guilty of the murders of Nicole Brown Simpson and Ronald Goldman. If you don't recognize Lange's face in O.J. : Made in America, his voice should still be familiar. He was the police officer who called Simpson during his infamous Bronco chase, though that isn't the only way Lange was involved in the case. 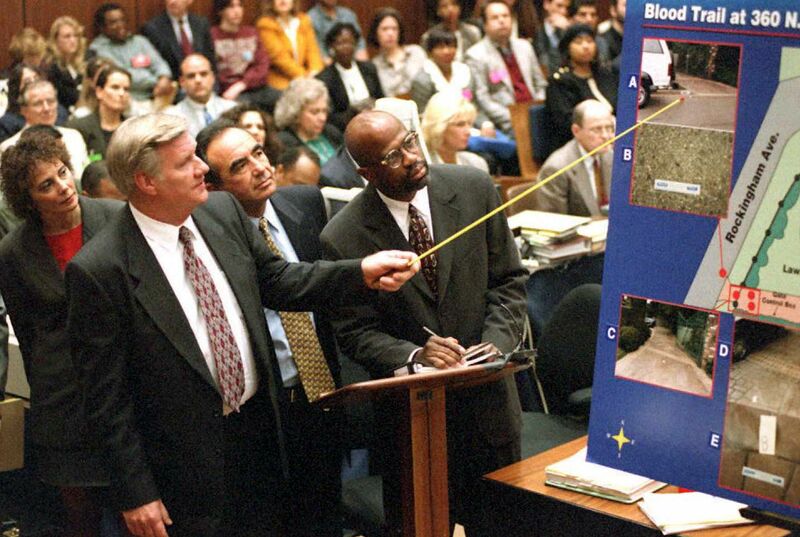 Lange assessed the murder scene and tried to deduce what happened on June 12, 1994. According to the Philadelphia Inquirer, he believed that "the lack of blood on Nicole Simpson's bare feet suggested that she 'went down initially, before the fight really ensued with the other victim.'" Detective Vannatter, meanwhile, determined that "the glove found by Detective Fuhrman was very rare, and that Mr. Simpson had bought one of only 200 pairs of that exact size and style that had ever been sold; he was even able to produce the receipt," as reported by the New York Times. However, much of the evidence from the crime scene was contested by the defense and Simpson was eventually acquitted. In December 1996, during Simpson's civil trial, Vannatter raised some eyebrows when he "blurted out that he believes Simpson is guilty of murder" while on the stand, according to CNN (Simpson maintains his innocence in the deaths of Brown Simpson and Goldman). At that time, Vannatter and Lange were both working on a book about the trial, titled Evidence Dismissed, and Simpson's defense lawyer Robert Baker mentioned the $115,000 book deal while questioning Vannatter, CNN also reported. The book would be published in September 1997 by the detectives and Dan E. Moldea, and you can read the first chapter, detailing Lange and Vannatter's initial arrival to the crime scene, on Moldea's website. After the trial, Vannatter and Lange were regular figures in media related to the trial, as they provided insight into the case. Lange, who retired from the LAPD in 1996, can still be seen discussing the case, and appears throughout O.J. : Made in America to offer commentary on the investigation and trial. Sadly, Vannatter died of cancer in January 2012, after serving as a police officer for 25 years, according to his New York Times obituary. Though they both had long careers as police officers and beyond, like so many other people involved in the case, the names Lange and Vannatter will always be associated with the Simpson trial.